Since moving to Korea four months ago, I’ve experienced only minor difficulties with the communication barrier. Most people speak at least a little bit of English — though I admittedly feel guilty for expecting them to speak in my own language when I’m in their country. I’m working on it! My point is that customer service here — at least in my experience — is outta this world. So what if shop owners shadow me while I walk around the store? They’re more than happy to answer any questions. When the cable guy installed my service (hallelujah! ), he realized I didn’t have a remote control. After motioning that he would be “right back,” he returned in under 10 minutes with a brand new remote, batteries and all. 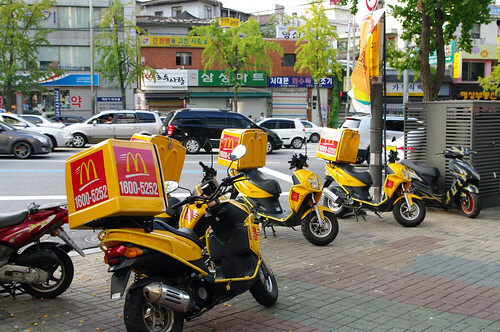 McDonald’s has home delivery service here, for God’s sake. Don’t feel like getting outta your pajamas to enjoy a Big Mac? Don’t. Just order in and you will be enjoying greasy, MSG-laced burger goodness in a flash. 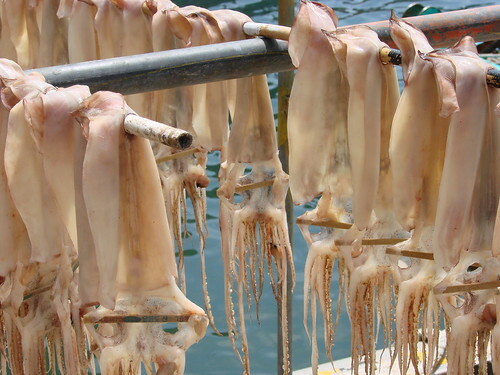 In fact, all food delivery in Korea is spectacularly different from what I’m accustomed to in the States. First, take-out isn’t relegated to crappy Chinese restaurants and pizza. You can get just about anything delivered here. And — here’s the kicker — there’s no delivery fee. How is that even possible?! This has lead to an overabundance of crazed delivery drivers on scooters tearing around the city at a breakneck speed to bring you your food while it’s still hot and fresh (and risking their own lives in the process). But damn, it’s worth it. From phone call to feeding my lazy face in less than 10 minutes: that’s what I call service. If you order from McDonald’s or a fried chicken joint (yes, Koreans love fried chicken — I’m in heaven), you’ll get your run-of-the-mill paper and plastic accoutrements. But if you order from a sit-down restaurant, they’ll also bring you real china plates, silverware, napkins — the whole nine. When you’re done, just put the dirty dishes outside your door. They’ll pick it up later. The U.S. is gonna have to step up its game if it ever wants to see this expat again. But all of this foodie fabulousness pales in comparison to the real inspiration for this post: NongHyup Bank. Yep, bank service is pretty miserable at the best of times, even when the teller and I speak a common language. But imagine trying to send money overseas in a country where you know next to nothing about bank-speak in the native language. The results could be catastrophic (to borrow a recent North Korean phrase). Unfortunately for Seong-Mo, I am babo (stupid) and wrote down an incomplete account number. Apparently, I also wrote down my phone number incorrectly, because the poor guy spent the whole next day trying to get in touch with me, to no avail. Fortunately, he was actually listening when I told him what school I worked at, so he called my school and explained the situation to them. I went back to the bank and he worked it all out. Another of my expat friends said that Seong-Mo actually came to her house to help her with internet banking. While I feel that this is borderline creepy (especially since he told me that my “students are so lucky to have such a beautiful teacher”) no one can deny that it’s some radical customer service. So thanks, Seong-Mo, for making my life here in Korea even better. Next post Welcome to Korea: Toilet paper at the dinner table?